If only that was the Tuesday I was having! Nope, instead I am jumping on a plane and off to LA for some work. Leaving fall behind and heading back to summer. You’d think I’d be excited for warmer weather but the fall season is my favorite, and I LOVE just being home for it. No worries though, I will only be gone a couple of days. Just a short trip. Plus, it’s always fun going to LA because my brother, Kai lives out there and it makes it feel more like I am at home than away. Speaking of fall? You guys remember yesterday how I mentioned that I hadn’t gotten a chance to check off very much on my fall bucket list? Well, my cousin Maggie? She’s checking off all the items for me and doing it like a pro. She text me the following Sunday night and it could not have made me happier. Girl after my own heart. Also though? I am totally jealous. So far this season Maggie has gone both apple and pumpkin picking, decorated for fall, burned her pumpkin spice candles (me too!! 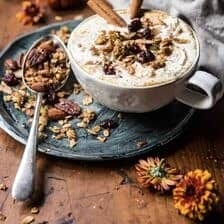 ), sipped on a pumpkin spice latte (me too, see this recipe), and took a drive through the Ohio Valley to take in all of the amazing fall foliage the Ohio Valley has to offer. I mean, the girl is doing fall right, right? Love her so much for her love of all things holiday. 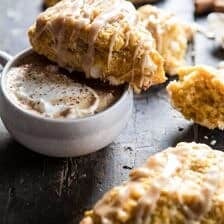 Luckily for me, I’m still doing fairly well on my fall bucket list, which includes baking up a pile of fall recipes likes these pumpkin scones. 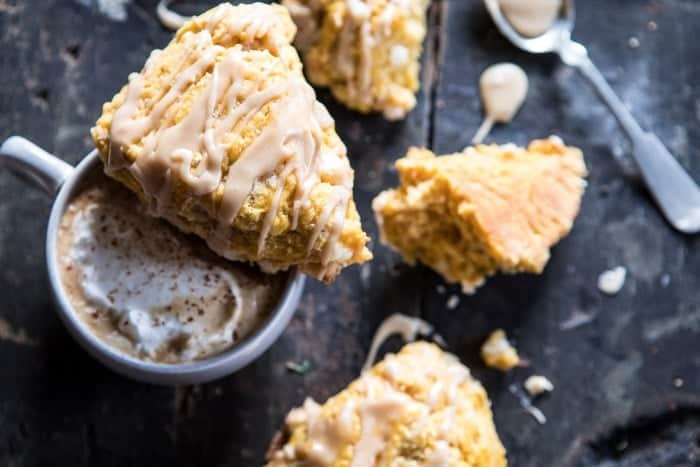 You guys, say hello your you new favorite scone of fall…or maybe even new favorite pumpkin recipe? Could we possibly say move over pumpkin latte? I’m not sure, but what I am sure of is that these scones are all things delicious. 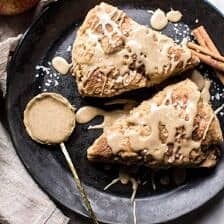 These are pumpkiny, buttery, hinted with cinnamon, super flakey and soft, and finished with the most perfect espresso maple glaze. 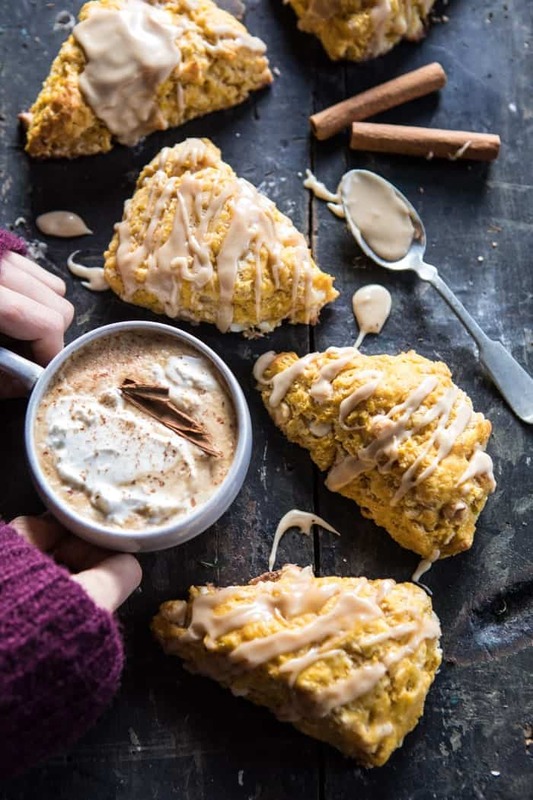 Kind of like a pumpkin spice latte, but in scone form…which as you might imagine, is so good. 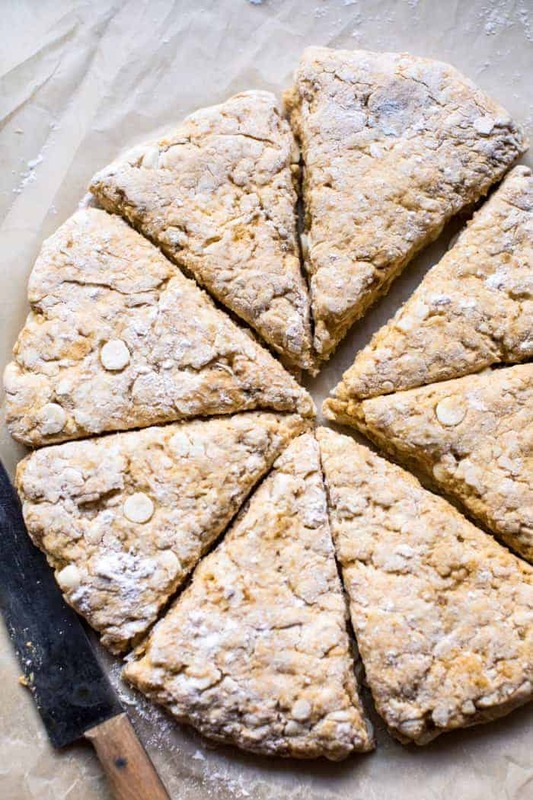 One of the great things about scones is that they are so easy to make. I made these in just about forty-five minutes, and that includes the time I added to chill the scones to give them more of a flakey texture. You just mix (it’s all in one bowl! ), bake, and drizzle with glaze. Simple. Simple. The scones themselves are super buttery, flakey, and pumpkiny. I highlighted the flavors of the pumpkin with a decent amount of cinnamon and a touch of vanilla. Then for just a little extra sweetness I stirred in some white just chocolate, because you know, it’s fall and why the heck not (totally optional though if you’d prefer your scones be more traditional). For the glaze, I wanted something a little unexpected, but obviously something that would pare well with all the pumpkin flavors. Naturally my mind swayed towards the idea of coffee, so an espresso glaze it was! And seriously? this glaze is the best. It’s not just like a bowl of powdered sugar, it actually has delicious flavor! And when drizzled over warm scones? Mmmm, nothing better. Here’s the deal. 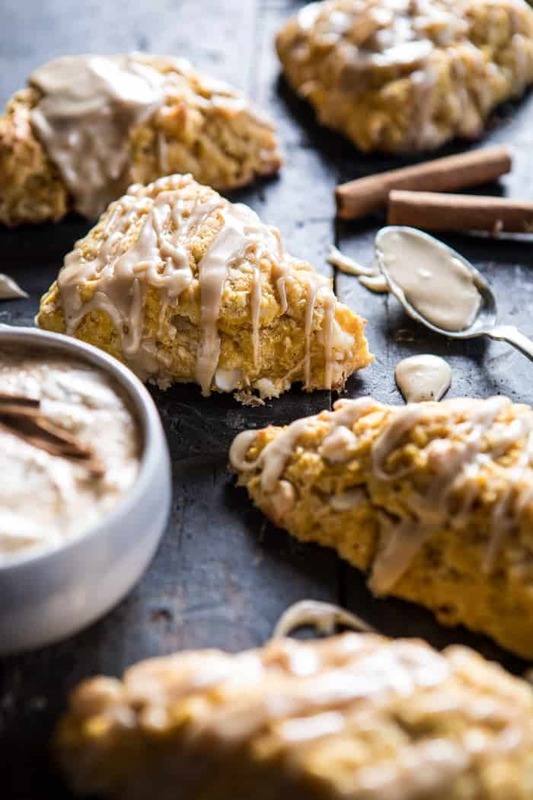 I know it’s only Tuesday and all, but I think we should make this a very special Tuesday and bake up some pumpkin scones…with a side of hot chocolate, because you know that’s how I roll. And trust me, as soon as I return home, these are the first item on my list to make…already excited about it. 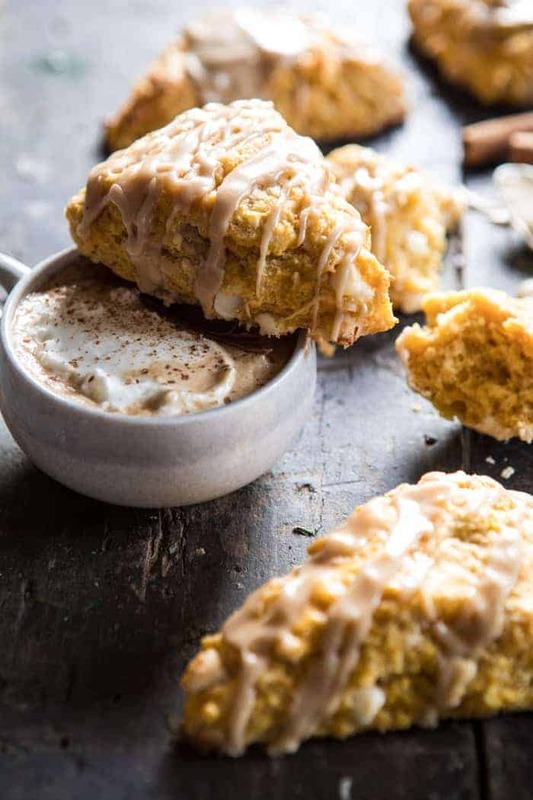 These scones are pumpkiny, buttery, hinted with cinnamon, super flakey and soft, and finished with the most perfect espresso maple glaze! 2. In a mixing bowl, combine the flour, sugar, baking powder, cinnamon and salt. Add the butter and toss with the flour. Add the egg, 1/4 cup buttermilk, pumpkin, and vanilla. Mix until just combined, being careful not to overmix. If your dough seems dry, add 1 tablespoon buttermilk at a time until the dough comes together. Fold in the white chocolate chips. Turn the dough onto a floured surface and then pat into a 1-inch-thick circle. Cut the dough into 8 wedges. Place the pieces about 2 inches apart on the prepared baking sheets. Brush each piece with buttermilk. Transfer to the freezer for 15 minutes. 3. Bake until golden brown, 15 to 18 minutes, rotating sheets halfway through. 4. Meanwhile, make the glaze. Add the butter to a saucepan. Allow the butter to brown lightly until it smells toasted, about 2-3 minutes. Stir often, butter will foam and then settle back down. Remove from the heat and whisk in the maple syrup, powdered sugar, and 1 tablespoon coffee, adding more coffee if needed to thin the glaze. Don't add more than 2 tablespoons. 5. Let the scones cool slightly and then drizzle with the espresso glaze. Serve warm and enjoy! ps. these have Thanksgiving written all over them. Just pointing that out for those of you who may be planning ahead! I would totally eat them, trust me. Yes! You have to make these, I am loving them! Thank you Kelsey! What has happened to the save button? It looks like I am missing it or it is no lomger an option to save these recipes to Big Oven Please help! Hi Nancy, we do not work with Big Oven, but I can look into getting the button back. Sorry for the trouble. These look fabulous! But so does the white latte mug in the picture!! Would you mind sharing the source? It’s anthropologie, but old. Thanks! I’m glad I’m not the only one who noticed the egg (eggs?) missing in the ingredients list, thought I was going crazy for a minute LOL. Does this recipe only call for one egg? I’ve never made scones before, so I really have no idea, lol. Thank you in advance for your help! I used one egg. It was perfect. These look so delicious. I would love to have them available on the spur of the moment. Could you continue to freeze them (well wrapped) for a time (2-3 weeks) at step 2 and then bake them straight from the freezer when it suits your schedule/mood/need? If so, would you adjust the baking time at all? These look awesome – I will be making them this weekend. Do you mean 10″ circle? Wow, they look absolutely stunning, and I love the idea of the espresso glaze. Love the combo white chocolate/espresso anyway. I just can’t wait to try them!! Thank you Del! I hope you love these! These scones sound to die for! I love anything pumpkin. Can it be fall forever?! I WISH! I would love all the pumpkin recipes year round haha! Thank you Sabrina! Looks delicious! And thanks for making them lower sugar. I’ve been enjoying making lower sugar food lately. Helps the other flavors shine! I agree! I am so glad you like these! Thanks Jennifer! Hey! 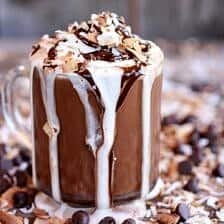 That sounds so good with the dark chocolate, let me know how it is!! Thank you so much, I hope you and your mom love these! 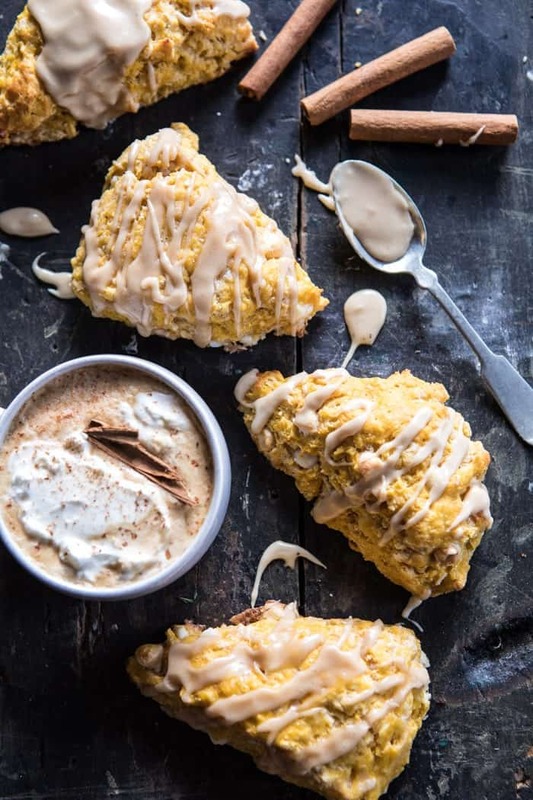 I’m in love with these scones – that espresso glaze is everything! I made these last night and they were delicious. They even kept well after being wrapped tightly overnight. I might add a little more pumpkin to really bring out the flavor next time. I second the question on whether it’s possible to store the unbaked scones in the freezer and throw them in the oven the day you want to cook them. I remember you saying a while back that you would potentially be doing some photography lessons online. I just love your photos and my sister and I just started a blog, but I really struggle with getting quality photos. Is this still a plan of yours? The scones look delicious by way! Made these tonight … wonderful! Reheated the glaze and turned it dark … looked like coffee flavored icing instead of a glaze. Didn’t hurt the taste, though. If you haven’t made these yet … don’t wait another day! I am so happy you liked this Dean! Thank you! I adjusted the recipe to be gluten-free and egg-free by using a quinoa/GF flour combination and an egg replacer. They came out really well! My husband who isn’t GF really liked them. 🙂 The only change I would make next time (and there WILL be a next time!) 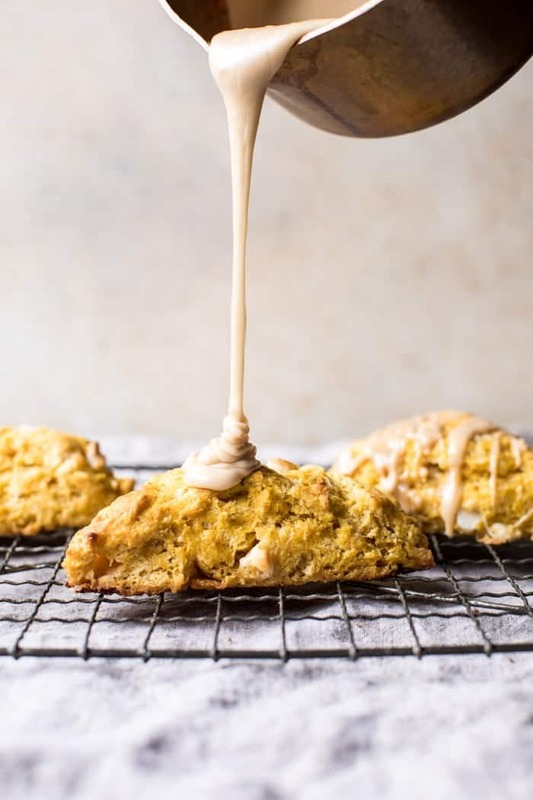 is to add some more spice (maybe a chai or pumpkin pie spice blend), as the flavor of the scone relies heavily on the chocolate chips and the glaze. If I could spice them up a bit, I could decrease the amount of the white chocolate chips and sugar in the glaze (which is a bit too sweet for my taste). Perfect with a cup of tea or coffee in the morning. Thank you so much for sharing…..NOW it feels like Fall! I am really glad these turned out so well for you Rachel! Thank you! These scones served with hot chocolate are pure heaven. Too good! I love your scones recipes! This is so strange, my scones were in the oven for at least double the time listed on the recipe. Usually, when following your recipes everything is spot on, but these turned out a little different, not very flaky, more cake like? Not complaining. 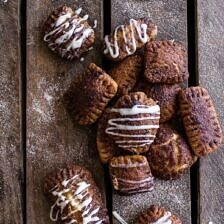 They are delish and I can’t wait to bring them to the family for Thanksgiving breakfast! I just wonder why mine turned out the way they did. Made these twice so far, and they are amazing!! Thank you Lindsay! I am so glad you liked these!